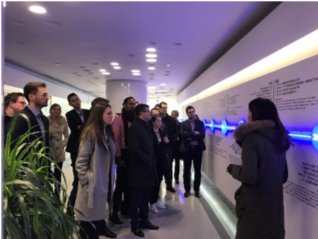 In the afternoon of April 9th, 14 IEMBA students of School of Management and Law, Zurich University of Applied Sciences (ZHAW) visited swissnex China. Dr. Felix Moesner, CEO of swissnex China presented the mission and activities of swissnex China and shared insights about the innovation landscape in China. The students asked many questions about intercultural management, challenges of IPR protection as well as the most important elements that will influence the success of business in China. Mr. Olivier Zehnder, Consul General of Switzerland in Shanghai gave an introduction about Sino-Swiss relations and Swiss presence in China and Shanghai, followed by a guest lecture given by Prof. Dr. Han Zheng, Innovation and Entrepreneurship expert. After the rich afternoon program, the delegation attended a networking event with Swiss expats in Shanghai organized by swissnex China. Composed of business leaders and young professionals with strong leadership potential all over the world, the IEMBA delegation of Zurich University of Applied Sciences (ZHAW) embarked on a field trip to China to get in-depth knowledge about doing business in the most fast-growing economy. swissnex China wishes them a successful trip in China! On March 11th, swissnex China had the pleasure of receiving 33 ETH Zurich MAS MTEC students, along with Prof. Stefano Brusoni, Xavier Mundet Ciriza, and Daniela Stocker. Dr. Felix Moesner, Science Consul and CEO of swissnex China, welcomed the participants and introduced the higher education, research and innovation landscape in China. This was followed by an overview of the mission and activities of swissnex China. Mr. Michael Lehmann, General Manager at sim (Selective International Management Shanghai), gave a lecture to the students, sharing his expertise on the many aspects of doing business in China. He presented the students with different practical cases that served as the base material for a workshop which they conducted throughout the week. After having lunch all together in a nearby restaurant, the students split into smaller groups in order to work and reflect on the selected cases. The entire delegation returned to swissnex China on Friday, March 15th. On this occasion, the different groups from the delegations shared and debated their conclusions from the workshop. Their proposed solutions and models were inspired by the various visits and presentations from which they had benefited during the previous days. Indeed, during the study trip, the delegation had the opportunity to visit different companies such as Bühler, Ctrip and Roche. One of our team members accompanied them on one of these visits, to the Ctrip headquarters in Soho. There, the participants were able to discover the operations of an innovative company in the field of online travel service. They received a presentation about the functioning of the company and its strategies both for the Chinese and on the international market. The visit was concluded by a enriching Q&A session. To wrap up this enlightening program, Mr. Olivier Zehnder, Consul General of Switzerland in Shanghai, invited the delegation for a networking reception at the Swiss Residence on Friday evening. They had the chance to connect with select members of the Swiss community residing in China, mainly from ETH Zurich alumni community in Shanghai, and the night was full of fruitful exchanges. swissnex China was delighted to receive the delegation of the MAS ETH MTEC program, a team composed of dynamic professionals who came to China to acquire new perspectives, knowledge and strategies in the field of management, technology and economics. Thank you to Michael Lehmann, sim for his presentation as well as Prof. Stefano Brusoni, Xavier Mundet Ciriza and Daniela Stocker for the amazing pool of talents. We look forward to welcoming them again next year! On February 25, swissnex China joined a visit of the Science & Technology Diplomatic Circle to the world’s most valuable artificial intelligence startup unicorn SenseTime. SenseTime focuses on computer vision and deep learning and is valued US$6 billion. SenseTime leads the market in almost all vertical industries, including smart city, smartphone, mobile internet, online entertainment, automobile, finance, retail, education, real estate, and so forth. The company boasts more than 700 customers and partners in China and overseas, including world-renowned institutions and companies such as Massachusetts Institute of Technology, Qualcomm, NVIDIA, Honda Motors, Alibaba Group, Suning, China Mobile, China UnionPay, wanda, Huawei, Xiaomi Technology, OPPO, vivo, orWeibo Corporation. It also established the National Open Innovation Platform for Next-Generation Artificial Intelligence on Intelligent Vision. The future plan is to extend its Shanghai base to host 3000 employees and accommodate the largest of 5 supercomputers with 30’000 GPUs. Already now, an impressive 250 PhDs in AI are working for SenseTime. On January 17, the swissnex China team joined its colleagues from the Section of Science, Education and Technology at the Embassy of Switzerland in Beijing for an insightful visit to the Beijing-based Land Space Technology Corporation Ltd. (LandSpace hereafter), a pioneer in the Chinese private commercial aerospace industry that was founded in 2015 by Tsinghua University. The teams from Shanghai and Beijing were warmly received by Landspace. LandSpace conducted the first Chinese private orbital launch on October 27, 2018 with its ZQ-1 rocket and is currently testing the ZQ-2, a medium-scale and low-cost commercial launch vehicle system that is independently developed by LandSpace with independent intellectual property rights. They aim to achieve reusable methalox orbital rocket launch by 2020. 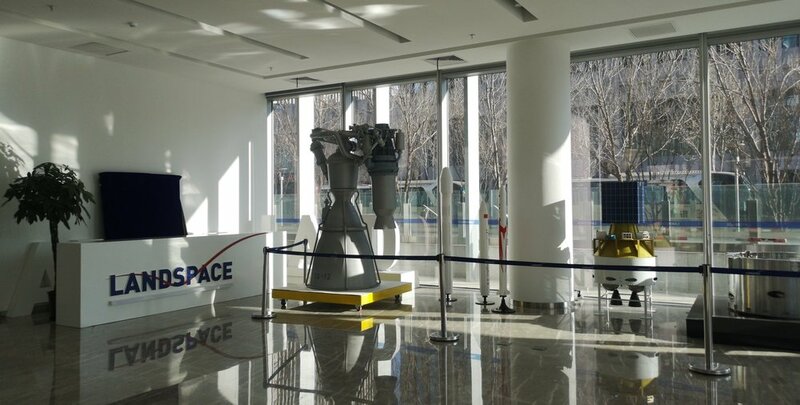 The private aerospace enterprise has two R&D centers based in Beijing and Xi’an, and an Intelligent Manufacturing Base in Huzhou, Zhejiang. LandSpace seeks to target the international market with its small and medium scale, low-cost launch vehicles. Mr. Kevin Xu gave a comprehensive introduction to LandSpace's mission, activities and products. Exchange between LandSpace and swissnex on the commercial aerospace industry. swissnex China received an in-depth presentation on the mission, activities and the evolution of LandSpace products. Ms. Liu Chenchen, Project Officer from the Beijing team, also presented to LandSpace the Swiss expertise in various deep-tech and high-precision fields, opening the dialogue for potential Sino-Swiss collaboration. Our thanks to LandSpace for their warm welcome and insightful presentation! We would like to express our fond appreciation to Mr. Kevin Xu (Director, Sales & Business Development), Ms. Emily Zhang (Chief Financial Officer) and Ms. Lisa Shen (Senior Sales Manager) at LandSpace for the warm welcome and their time in presenting the activities. Our thanks to our colleagues in Beijing for arranging the visit. Shanghai & Beijing teams at the Great Wall. Morning breakout session with Shanghai and Beijing teams. In the morning of the 17th, our Shanghai and Beijing teams also held a fruitful breakout session defining strategies, sharing best practices, exploiting synergies as well as tackle the challenges. Each of the sections also presented their 2018 activities and outlook for 2019. On January 14, swissnex China joined its peers from the Science & Technology Diplomatic Circle for its first event in 2019, which was a visit to Alibaba Group's Cainiao Future Park in Wuxi. The logistics arm of the leading Chinese e-commerce platform is highly innovative and ambitious. Group photo with the members of the S&TDC and the hosts of the visit from Alibaba Group. It was an insightful visit of the largest automated warehouse in China with over 700 robots (= automated guided vehicles or AGVs). Most of the robots seen in action are Quicktron robots able to lift racks up to 500kg and automatically pick up a parcel and deliver it to another part of the warehouse where it is then picked up by a delivery firm. One purpose of the new flagship warehouse is field testing various logistics technologies as well as establishing new standards. The new process has brought significant time savings and improved accuracy reaching 98%. 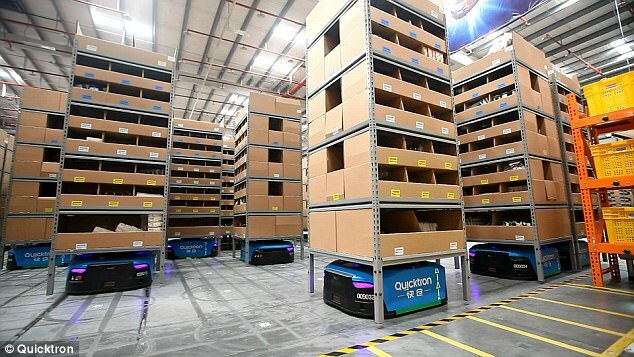 Alibaba invested billions to build a national Internet-based intelligent logistics backbone in China and works nowadays with over 3000 partners worldwide. Its publicly stated goal for the next 5-10 years is to deliver to anyone in China within 24 hours and internationally in 72 hours. In 2018, it took 2.6 days to deliver the 1042 million parcels ordered during 11.11, the Singles Day. On the statistics side, Cainiao covers internationally 224 countries and regions and domestically more than 2700 counties and villages, is connected with over 3 million express courier personnel, and processes 16 trillion pieces of logistics data per day. The smart logistic network has a daily average package volume of 69 million connected to the whole society. Cainiao is developing highly innovative solutions and technologies such as Unmanned Aerial Vehicles (UAVs), unmanned vehicles, express towers, cabinets which can be unlocked using facial recognition, and many more. Some of those technologies are already in use as pilot projects in some university towns. Shanghai, October 25 – Continuing the Future of Money series, swissnex China co-organized ‘BlockchainBites’, our first Blockchain luncheon. The speakers were Dr. Wei Cheng, Co-Founder of ChainFunder (top tier Chinese CryptoFund) and Quentin Reyes, Junior Project Leader on Blockchain at swissnex China. They both focused about the latest blockchain trends and perspectives in Switzerland and China. After Quentin gave an in-depth overview of the Swiss Fintech and Blockchain landscape and the new “Blockchain Center” at the University of Zurich, Dr. Cheng talked about blockchain developments in China and the latest “Dos” and “Don‘ts” in an interview format. The dialogue finally moved into an active Q&A with the 80 people in the audience. This event “BlockchainBites” was in partnership with SwissCham (Digitalization Committee), UZH Alumni Shanghai and Presence Switzerland and held at the Four Seasons Hotel, Shanghai. Background: The "Future of Money" series on FinTech by swissnex China was held in Shanghai, Beijing and Hong Kong and focused on Blockchain and AI in WealthTech. The event BlockchainBites is the 7th event of this series in Greater China. Last Tuesday at Careum Zurich, swissnex China’s team was proud to have organized the annual event of the swissnex Network in collaboration with State Secretariat for Education, Research and Innovation SERI, fostering ground-breaking discussions on the regulations, opportunities, threats and challenges surrounding the topic of Blockchain and offering a unique opportunity for the swissnex Swiss partners and Blockchain actors to meet the Swiss global network for education, research and innovation. During the day, top Blockchain guest speakers shared their views and insights over the current and future state of the Blockchain technology. With the swissnexDay’18, swissnex China organized it’s first event outside of China and we are very proud of the quality, the popularity and the positive reviews we received during and after the event from not only the other swissnex outposts but also from Swiss Blockchain entrepreneurs, academia and government officials. We would like to thank our high-profile speakers: Ambassador Mauro Moruzzi (SERI); President Michael Hengartner (University of Zurich); President Lino Guzzella (ETH Zurich); Thomas Heiniger (Kanton Zürich); Katherine A. Foster (CSO, BLOC), Daniel Haudenschild (CEO, Swisscom Blockchain), Livio Luca Ammeter (FINMA), Olga Feldmeier (CEO, SMART VALOR), Sam Lee (Founder & CEO, Blockchain Global Limited), Thomas Puschmann (Swiss Fintech Innovations) and Alan Wunsche, MBA,CPA,CBP, (CTO, TokenFunder), and our panel moderator Olivia Chang (CNNMoney Switzerland). We would also like to express our appreciation to our event partners University of Zurich, ETH Zurich, CNNMoney Switzerland, Crypto Valley Association and Careum Zurich for their strong support. While the year is coming to the end, the technology community in Shanghai is still going strong, and as such swissnex China had the pleasure of being invited to a few conferences and events about various tech related topics. Read more below. Based in Silicon Valley, Plug and Play is one of the largest startup accelerators in the world. It has helped grow companies such as PayPal, Google, DropBox, SoundHound etc. In China, Plug and Play has invested in more than 200 startups and accelerated over 500 startups. The Fintech Selection Day, which saw 20 Fintech startups pitching from fields such as big data analysis, flash payments, and meteorological risk analysis, as well as the inauguration of Plug and Play's new Blockchain Innovation Lab. Brand & Retail / Supply Chain Tech Focus Day, with 12 startups pitching and demonstrating innovative new retail concepts on the one hand, as well as disruptive unmanned vehicle services on the other. Leon Zhao, one of the panelists at our Homes of Drones event a few weeks ago, was among those pitching with his startup Antwork. FEA-Consulting, a subsidiary company of The Blockchainer, has been holding in-depth and high-end summits in fintech, consumer finance, commercial banking, internet insurance, wealth management, AI, blockchain and digital assets areas for many years. It has so far served more than 5,000 outstanding global companies and 30,000 industry leaders. The Finners City 2018 Digital Finance summit brought together international fintech associations, governments, old & new financial institutions, tech providers, as well as investors to discuss and explore the future of digital finance. The Summit provided interesting insights into the future of fintech: indeed, there seemed to be a consensus among the fintech associations of Zhejiang, Taiwan, Japan, Singapore, and Hong Kong, that the next "battleground" of fintech will be in blockchain and data protection. The Blockchainer's conference "Chain Plus +" focusing on the Iterative Development and Regulatory Trends in Blockchain. The event offered interesting insights, particularly in the applications of blockchain technology in various fields including crowdfunding and gaming. The crypto winter was a notably recurring theme in many presentations. Once again, there were some familiar faces at the conference, including Olga Feldmeier of Smart Valor, who will be a speaker at swissnex China’s Blockchain event in Zurich on December 11. IPIEC GLOBAL 2018, guided by China’s Ministry of Industry and Information technology, is an entrepreneurial and innovation contest originated in China, aiming to bridge splendid ideas and innovation from overseas to the promising China market. The competition offers selected startups a business development week in China, including meetings with Chinese companies, industry clusters and investors in multiple cities across China. On October 26th 2018, WTOIP in collaboration with Venturelab hosted the Swiss final of the IPIEC GLOBAL 2018, where 10 startups were pitching for a chance to win up USD 100,000 and a seat for a business roadshow in China. Insightness, Amphasys AG, MORPHEAN and BIOWATCH came out on top, selected as the top 30 IPIEC GLOBAL 2018 global champions, and compete with the world's best players for the $100,000 championship prize; deeply participate in the Chinese roadshow tour, and face-to-face exchanges with investors and potential cooperation agencies across China. Insightness was selected as TOP 10 advances into Final ceremony of the IPIEC GLOBAL 2018 in Guangzhou on December 13th. MORPHEAN signed cooperation agreement with Chinese partner in Final ceremony. - Amphasys focuses on the market development of pollen quality analysis and stands for an innovative and patented new "lab-on-chip"-technology to analyze single cells: Microfluidic impedance flow cytometry. It allows analysis of almost any kind of single cells from human, animal and plant sources as well as bacteria, yeast and algae. Taking into account that some high quality seeds are more expensive than gold (in weight), the reliable determination of pollen quality obviously becomes a key success factor in the seed production process. The most distinctive measure is viability (cell activity), in addition to count, concentration, size, and cell differentiation. - BIOWATCH delicates to Wearable safety certification devices which can be used in payment, auto, access control and other areas. Wearable devices coupled with adequate biometric authentication have the power to avoid the cumbersome nature of authentication from daily lives. The products integrate finger vein, NFC and Bluetooth technologies to enable customers to have a better security authentication experience, ensuring user security and privacy. - Insightness develops a highly efficient vision sensor technology which is inspired by people's eyes and builds spatial AI solutions (Vision Chip & Software) that allow devices to understand the structure of their environment, how things move and where they are located. The system uses self-designed chips and its tracking speed is 100m/ms which is 100 time faster than others. While this was already successfully deployed in drones, the current focus of Insightness is AR, VR and MR.
2. Retail: To solve the problems of biometric identification, passenger flow statistics, consumer behavior analysis, face payment, KPI assessment. MORPHEAN signed cooperation agreement with Chinese partner in Final ceremony of the IPIEC GLOBAL 2018. As technology advances at an breathtaking pace and we are invariably impacted by innovations in our society, everyone is trying to stay up to date on the latest and greatest developments; The military is no exception, and to this end swissnex China had the pleasure of organizing a 3-day program from November 5 to 7, focusing on emerging technology trends in China for the visit of Mr. Quentin Ladetto of Armasuisse, a Federal Agency of the Swiss Confederation responsible for the procurement of armaments for Switzerland. The program organized by swissnex consisted of three days. On the first day, swissnex China brought Mr. Ladetto to Hangzhou, a city neighboring Shanghai and famous for its West Lake as well as for hosting Alibaba’s HQ. With the help of Lucas Rondez, CEO and Founder of NiHub, an organization helping foreign startups in China, Mr. Ladetto had the opportunity to visit HIKVision, world leader in video surveillance products, NiHub’s latest office space, as well as Getui.com, a leading third-party push notification service provider, as well as We Meet, a platform for European SMEs to launch in China. On the second day, Mr. Ladetto was able to visit the China International Import Exhibition (CIIE), the world's largest trade expo taking place in Shanghai. With enterprises from over 100 countries and every possible field, the Exhibition provided the ideal environment to explore the latest technological developments and innovations. On the third and final day of the program, Mr. Ladetto visited the Beidou Research Institute, a non-profit platform promoting the Beidou Navigation Industry, China’s equivalent of America’s Global Positioning System (GPS). The Institute is also home to a “Robotics Testing & Training Area”, which is one of the largest indoor “sandbox environments” in China allowing for the testing and validation of mobile robots. Mr. Ladetto’s trip then continued to South Korea, followed by Japan. On November 12, the 4th Sino-Swiss Theme Week was inaugurated at Sino-Swiss Zhenjiang Ecological Industrial Park; With a special focus on Sino-Swiss cooperation in vocational training and education, the event was well-attended by researchers, schools and companies from both countries. Mrs. Libing Gu, Project Leader of Academic Relations of swissnex China gave a keynote speech on the Swiss vocational & professional education as well as the training system, during which she shared with audience the latest facts and figures and illustrated the reasons why vocational education continues to be such a popular choice for education in Switzerland, while enjoying long-standing prestige worldwide. Sino-Swiss Zhenjiang Ecological Industrial Park, the Chinese education and technology company Tomorrow Advancing Life (TAL) and ZHAW Zurich University of Applied Sciences represented by its Head of Competence Center Asia Business School of Management and Law signed a cooperation agreement at the event. ZHAW will contribute to the content development by providing online vocational learning programs. On November 2, 2018, the Sino-EU Innovation Week of Health Technology wrapped up to great fanfare in the beautiful Nanjing, with innovators from Germany, Sweden, Switzerland and China. The attendees gave praise to the host's investment and life science community, facilitating Sino-EU collaboration in health technology innovation. swissnex had the privilege of attending this high-level event during its closing days in Nanjing, in particular the inauguration of award and opening of ICCAMT-Nanjing, and had the opportunity to network with interesting companies in the field of biotechnology, health technology and medical technology. You will find below detailed information on companies that were representing Switzerland at this event, as well as a summary of their products / services and the remarkable results they acquired. Biognosys AG, a company that had collaborated previously with “our cousins” from swissnex Boston, was represented by Oliver Rinner and Lidia Novak. They won one of the 2nd Health Technology Innovation Award. Biognosys was founded in 2008 and is a privately held company in Zurich, Switzerland. Originally an ETH Zurich spin-off from the lab of Prof. Ruedi Aebersold, Biognosys is a pioneer in the field of proteomics and caters to the Pharma, Biotech, Diagnostics and Agricultural industries. Biognosys believes that the decoding of the proteome will impact life science more than the genome revolution a decade ago. They provide innovative services and products for protein quantification using cutting edge technology and strive to be the company that provides the best possible solutions to support researchers in their protein analysis needs. Their next generation technology quantifies proteins with unbeatable precision and depth. The solution is based on mass spectrometry based targeted proteomics technology, which provides simultaneous quantification for thousands of proteins in a single experiment. Dualsystems Biotech AG, represented by its CEO, Dr. Paul Helbling, won one of the 3rd Health Technology Innovation Award. Dualsystems Biotech does target identification on living cells using the LRC-TriCEPS platforms as their core technologies. They are a specialized proteomics service provider working already with 15 of the 20 largest pharma companies and with a large number of Biotech companies worldwide. They also support discovery reach by collaborating with Universities around the globe. Dualsystems Biotech have the only technology published so far to identify the unknown receptors of ligands (small molecules, peptides, proteins, antibodies, ADC, biologics, Fc-fusion proteins, and viruses) on the living cells to elucidate the Mode-of-Action of a molecule by target deconvolution. With their TriCEPS platforms they have a tool to optimize, identify and validate the targets. Further, they can identify new cell-cell interactions similar to PD-1/PDL-1 to identify new drug targets i.e. on primary human T-cells using the extracellular domain of any receptor fused to an Fc-tag to identify new drug targets. At the same time a large portion of the surfaceome (proteins expressed in/at the cell membrane) are identified. The technology has been shown to be able to detect where the peptide/protein/virus and small molecule docks on the living cell. MagCath ApS, represented by its CEO Niels Erikstrup, proposes an alternative option for women that are thinking about undergoing mesh surgery due to stress urinary incontinence. Surgery has risks and may not work at all. That is why MagCath ApS have developed and clinically tested a unique medical device called Obtinu. Obtinu is a single-use, very soft, silicone tube, that the user herself inserts in the urethra each morning. The tube stays in place all day, and has an inner valve, which restores control over bladder voiding. The tube is pulled out and discarded in the evening, before going to bed. Obtinu has a high user approval as it is both comfortable and easy to use. swissnex also had the chance to connect with Serge Perriard, Managing Director of BioTalk GmbH. Over a period of 12 years, BioTalk has also published the special interest journals BioWorld and BioWorld Europe. Since over 3 years together with their partners in Switzerland, Finland, Italy, USA, and Israel, they are focusing on building bridges between Swiss & European SMEs on the one side and Chinese partners & investors in their sector on the other side, and have organized and initiated many events, roadshows, and cross-border partnerships. Among others, BioTalk has enabled excellent cooperation between the Swiss Technopark Alliance and their closest Partner company in China, Beijing YiGu Venture Capital Management & Consulting Co. Ltd. This leading healthcare technology developer in China is setting up and managing healthcare initiatives, incubators, and industry parks. Moreover, BioTalk maintains partnerships with many other industry & innovation park, event & media, and VC&PE investment fund managers, as well as with international relations managers from large pharma & medtech companies and with government officers, responsible for economic industry zone development in Hong Kong, Foshan, Guangzhou, Shenzhen, Hangzhou, Shanghai, Nanjing, Jinan, and Beijing. swissnex would like to congratulate all the companies for their interesting presentations, great results, and engagement. A huge bravo to Karin Schütze, Managing Director of CellTool for winning the 1st Health Technology Innovation Award. A special thanks to Dr. Hui Wu and Matthias Hölling for the invitation and to iCCAMT, Beijing, TechnoPark, Germany Medical Valley, Steinbeis Stiftung and Business Sweden for the organization of this event. For the past few years, China has seen its economy grow at a fast-paced rhythm with a keen interest towards innovation, making it an ideal location for high-tech startups to stress-test ground-breaking technologies while seeking international expansion. Moreover, it goes without saying that China also opens doors to other Asian markets. Nevertheless, foreign companies doing business here are faced with a set of challenges both cultural and operational, tangible and intangible. These challenges are amplified if these foreign companies are small and have only limited financial resources and manpower. In light of the above, the Venture Leaders China program was launched to offer a platform for a selection of 10 disruptive startups from Switzerland to connect with China over a 10-day roadshow across 5 cities: Hong Kong, Shenzhen, Shanghai, Beijing, and Tianjin. The trip included business workshops, investor meetings and public events. A few weeks ago, the 5th consecutive edition of Venture Leaders China 2018 ended after 10 days full of learning, memorable experiences, and, most importantly, valuable contacts from various industry professionals of the local startup ecosystem and multi-million and -billion-dollar investors. All in all, as we look back at this 5th edition of Venture Leaders China, we can be more confident than ever that this program is an ongoing success story. All the startups showed high levels of satisfaction regarding the trip, with some of them already having secured investments, signed agreements and booked flights to come back in the next few weeks for follow-up meetings with potential investors and clients that were met during the trip. Moreover, the feedback from the audience of the various pitching events was nearly unanimous: the quality of the startups was one of the highest they have ever seen, and the pitching events were among the best they have attended. The valuable agreements signed here as well as these laudatory words provide evermore justification for the program and remind us of the high potential of Swiss startups, but also of the importance to support them. Today’s big firms were yesterday’s disruptive startups and the Venture Leaders platform provides the perfect gateway for startups to accelerate their growth, which eventually will lead to positive spillovers back in Switzerland, in terms of both employment and an increase of the quality of the already excellent Swiss innovation ecosystem. More information below including testimonials and details of the individual events. This year, the delegation was composed of Jordi Montserrat and Beat Schillig of Venturelab, Mathias Paquier of Canton de Vaud, Michael Friedrich of DistalMotion, Reto Naef of Topadur Pharma, Aurélien Rizk of InterAx Biotech, Marco Salerno of Foldaway Haptics, Raj Lehal of Cellestia Biotech, Noris Gallandat of GRZ Technologies, Zhenzhong Su and Lukas Meier of Fixposition, Carlos Ciller of RetinAI, Matthew G. Hall of SimplicityBio, and Nilson Kufus of Nomoko. The program started in Hong Kong with a morning at Invest HK, the local investment promotion bureau, with insights from Charles Ng and Jayne Chan into the attractivity of Hong Kong as a place to do business, as well as Karena Belin of WHub discussing the local startup ecosystem, while Peggy Cheung of Jones Day offered a presentation about IP and Licensing. The afternoon session consisted of more business insights at the Hong Kong Science and Technology Park with a first presentation by Julia Fung introducing the HKSTP and how they promote innovation, technology, and entrepreneurship in Hong Kong. The afternoon continued with insights from Luciano Tattoni of Compagnie d'Investissements et de Gestion Privée into the services his company provides for startups in Hong Kong. Finally, a panel discussion took place discussing "Business Development in China and the rest of Asia from Hong Kong" and "Fundraising in Hong Kong and China", organized by Helen Lo of the IMD Business School Alumni Club Hong Kong. The program was off to a great start. After all the valuable inputs of the morning and afternoon sessions, the Venture Leaders took the stage for the first time during this trip as they pitched at the Hong Kong Trade Development Council in the Hong Kong Convention & Exhibition Center. After a welcome speech by Andreas Rufer of the Consulate General of Switzerland in Hong Kong, Regina Lai of Hong Kong Trade Development Council, and Jordi Montserrat of Venturelab, the startups launched the show, with a high-quality audience of over 100 people. After a busy first day in Hong Kong, the Venture Leaders headed to a neighboring city famous for its culture of innovation and often referred to as the Silicon Valley of Hardware: Shenzhen. The day began with a company visit at VisionerTech, an AR/VR company specializing in hardware and software. The visit provided a first time look for many of the participants into the daily operations of a Chinese company. In the afternoon, the Venture Leaders headed to the Shenzhen Stock Exchange for their first pitch in mainland China. After some introductory words by Shenzhen Stock Exchange representatives, Felix Moesner of swissnex China, the Consul General of Switzerland in Guangzhou, KPMG China, as well as Lutz Berners of Berners Consulting, the Venture Leaders took the stage and began their presentations. The audience consisted of many eager investors who never missed an opportunity to ask questions at the end of each pitch, a true testament to the quality of Shenzhen as a business and innovation hub in China. After an exciting day in Shenzhen, the Venture Leaders headed to Shanghai for an evening pitch on the Bund, at the SOHO co-working space. After some introductory words by Felix Moesner of swissnex China, as well as Cun Jie Li, CEO of Money Weekly Culture Development, the startups started their usual business, but this time with a twist: live software generated translations, courtesy of iFlytek, a world leader in AI language solutions. Moreover, the evening had a competitive component, as a very Swiss voting round took place at the end, where the attendees had the chance to vote for their favorite startup of the night. With 35 votes, Michael Friedrich of DistalMotion walked away with the win. All this was followed by networking and more interactions between the startups and the attendees. The audience was very interactive and proved once again that Shanghai is very business-minded. With 6/10 of the Venture Leaders being healthcare startups, a special session dedicated to this field was held in the afternoon. Ronghui Gao of G-Med Consulting gave an “Overview of the Life Science Industry in China”, Haohao Zhang of Cenova discussed “Cross-Border Investment in Healthcare”, and finally Xia Meng of Cellular Biomedicine Group presented a “Successful Sino-French Equity Joint Venture Story” in Biopharma. The coaching session provided the Venture Leaders with a unique chance to sit down with all of these industry experts and to have 1-on-1 discussions about issues specific to their business. Following the two busy days in Shanghai, the Venture Leaders were in the Chinese Capital of Beijing to spend the day at the Zhongguancun Dong Sheng Science Park (DSSP). The morning saw the Venture Leaders pitching as part of the European Division Semi-Final of the 6th "Dongsheng Cup", an international entrepreneurship competition. After some opening words by Hbous Hassan of the DSSP, the inauguration of a cooperation agreement between Venturelab and the DSSP, and the 10 pitches, Reto Naef of Topadur won the "competition", giving him the opportunity to come back for the final in December. The pitching session was followed by a visit of the park for one part of the group, and afternoon 1-on-1 sessions with investors for the other part. This session at the DSSP was an excellent illustration of a fruitful win-win cooperation between Venturelab and the DSSP, providing both parties with tangible added value for their stakeholders. Later, the Venture Leaders concluded a busy day with a final pitch in the evening at the Embassy of Switzerland, after some introductory words by Nektarios Palaskas and Swiss Ambassador Jean-Jacques de Dardel. For the last three days of the program, the Venture Leaders headed to Tianjin, where the Summer WEF was taking place, with distinguished attendees such as Li Keqiang and Jack Ma. This provided the entrepreneurs with the rare chance to rub shoulders with world leaders and business decision makers and expand their network, as well as take part in various workshops and presentations. The final night of the WEF was marked by the Swiss Incubator event, a platform dedicated to Swiss high-tech startups which was initiated by the Embassy of Switzerland in China. The startups pitched for the last time of the program, and Noris Gallandat walked away with the prize of best pitch. 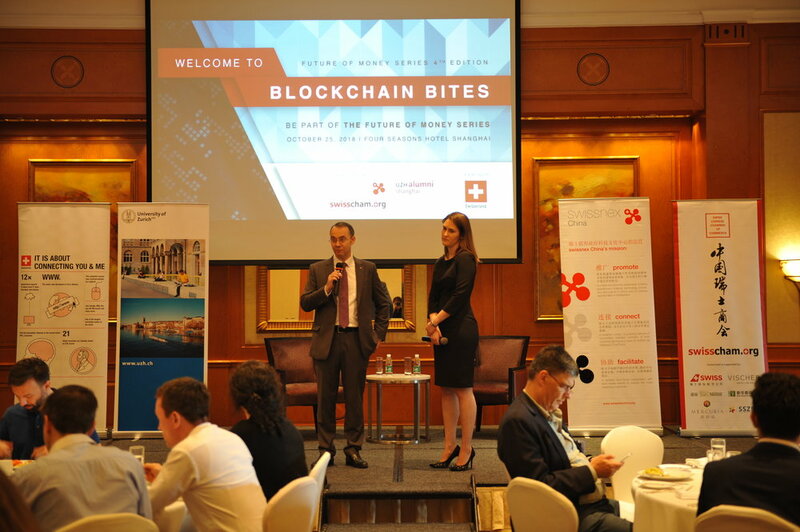 On October 25, swissnex China in collaboration with SwissCham Shanghai and the UZH Alumni Chapter Shanghai, held the fourth edition of the Future of Money Series: ‘Blockchain Bites – Be part of the “Future of Money” Series’ as a luncheon event at the Four Seasons Hotel in Shanghai. With an audience of 80 people, the key highlight of the event was an expert interview of Dr. Wei (Chris) Cheng, Co-Founder of ChainFunder (Blockchain VC), by Quentin Reyes, Blockchain Junior Project Manager at swissnex China, which focused on latest Blockchain trends in Switzerland and China. 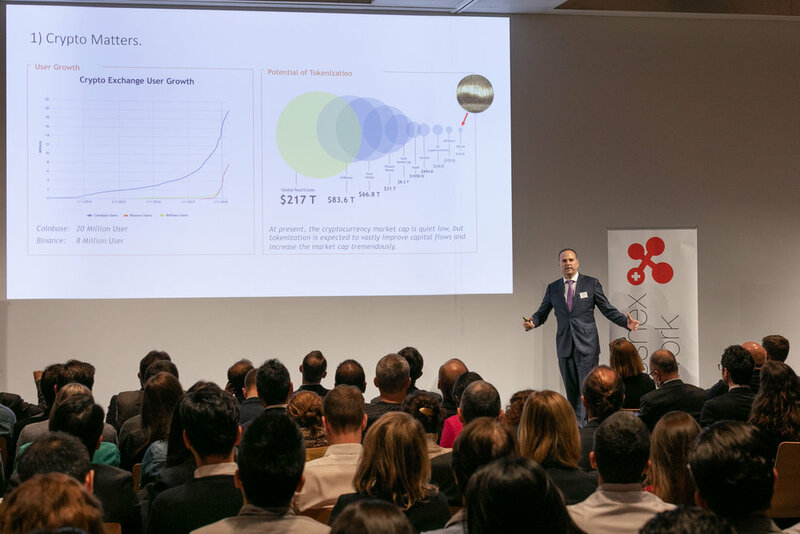 The event was kicked off by Dr. Felix Moesner, Science Consul and CEO of swissnex China, and Gianna Abegg, Board Member of SwissCham Shanghai and Co-Chair of the UZH Alumni Chapter Shanghai. While the guest were enjoying their desserts and post-meal coffee, Quentin Reyes, Junior Project Manager Blockchain at swissnex China, gave a broad overview on the Swiss Fintech/Blockchain ecosystem. The presentation was followed by an expert interview with Dr. Wei (Chris) Cheng of ChainFunder about blockchain trends in China moderated by Quentin Reyes. During the interview it was also possible for the audience to ask questions – an opportunity the guests appreciated; many questions were asked. From left to right: Makiko Aikawa, Gianna Abegg, Quentin Reyes, Dr. Wei (Chris) Cheng and Dr. Felix Moesner. Under the theme “Three Times: Past, Present and Future”, the 4th Triple Parade Contemporary Jewelry Exhibition opened on 19 October at HOW Art Museum in Shanghai. Featuring in Asia for the first time, the exhibition presented a selection of 500 pieces of artworks by nearly 300 artists from 34 countries and regions, which included designs selected by open call, international galleries and curators. In addition, a special section featuring crossover designs from contemporary visual artists was presented, which created inspiring dialogues between fashion, art, design and innovation. The project was presented jointly by Design and Innovation Collage of Tongji University and HOW Art Museum, which consists of exhibition, symposium, lectures and workshops. The exhibition will last till 6 January 2019 and the public programs will be held during the exhibition period at both Tongji University and HOW Art Museum. On October 18, swissnex China joined its peers from the Science & Technology Diplomatic Circle on an insightful visit to the Yangshan Phase IV Automated Terminal, the largest automated container terminal worldwide. Compared to traditional container terminals, the automated terminal requires 70% less staff to operate, and is 30% more efficient at full capacity. Yangshan Phase IV Automated Terminal is the largest container terminal worldwide. The terminal was constructed in December 2014, and opened for trial operations in December, covering a total land area of 2.23 million m2, with a quay length of 2350 meters and 7 deep water berths. It is located on the west side of the Yangshan Deep Water Port - one of the busiest ports in the world. The port is built on the islands of Greater and Lesser Yangshan and is connected to the mainland through the world’s largest sea bridge – Donghai Bridge. Compared to traditional container terminals, the automated terminal requires 70% less staff to operate, and is 30% more efficient at full capacity. The quay cranes use a double-trolley structure, with the main trolley in remote control and the portal trolley in full automation. Yangshan Phase IV Automated Terminal relies on three key advanced automated equipment for its operations: the Quay Crane (QC), the 16 Automatic Stacking Crane (ASC) and the 80 Automated Guided Vehicle (AGV). The quay cranes use a double-trolley structure, with the main trolley in remote control and the portal trolley in full automation. The ASCs are fully-automated, with the standard, single-sided and both-side cantilever ASCs working in collaboration to improve efficiency. The AGVs, equipped with hydraulic lifting platforms and 8-hour lithium batteries, are guided by transponders and work with a fully-automated battery exchange system to ensure 24-hour operations. The terminal runs mostly on renewable energy, drawing much of its power from an immense wind park nearby. The handling and transportation systems run fully on electric power. We were delighted to have joined our peers from the S&T Diplomatic Circle on the insightful visit. We were delighted to have participated in the visit with our peers from the S&T Diplomatic Circle, and would like to express our special thanks to Mario Quina (Consulate General of Portugal) for his great work in coordinating this visit. Field Remediations: Carbon explores human and technological interactions with the carbon cycle, sampling the spectrum of material practices, opportunities and challenges associated with development of remission and Negative Emissions Technologies (NETs). The goal is to align the science-fiction of carbon capture with the science-fact of its current research and implementations. The fieldwork conducted in Switzerland, Canada and in Shanghai also populated the CARBON Collection of the Field Remediations Library, which was installed for the Machines are not alone exhibition at Chronus Art Center. The project was enabled by generous strategic support from swissnex. Our enormous thanks go to Felix and Rahel for providing us in the last minute with a means of transport for our group and a fantastic driver who expertly delivered us to every fieldwork location (a task not to be taken for granted in Shanghai). The project couldn’t have happened without it, plus we got to meet the wonderful swissnex team. One of the highlights of our field visits in Shanghai was a visit to Professor Zhu Xinguang’s lab, and the Plant Systems Biology Group at the Chinese Science Academy, where we learned about their efforts to engineer more ‘efficient’ rice. These and related bioengineering initiatives are designed to significantly increase agricultural crop yields, making them into ‘better’ carbon sinks. Dr. Xinguang is involved in a number of international collaborative research projects, in the works for years, that are showing promising, ifn tendentious, results. If we were to similarly engineer all industrial and large scale crops, they could create a global drawdown of carbon that would sequester much more atmospheric CO2 than currently, transforming the climate and its changes. While in Shanghai our team also visited Shanghai Baosteel, one of the largest steel enterprises in the world, which is working to lower its CO2 emissions. Because of the chemical processes at the heart of steelmaking, the plant cannot completely cut its emissions, so it faces a dilemma that we all face on a planetary scale. In order for the plant to be ‘carbon neutral’, and in order for global CO2 emissions to reach net zero negative emission technologies are a necessity. One less controversial negative emission technology is a technique developed by a Swiss startup Climeworks, which we visited before our trip to China. The technique they use is known as Direct Air Capture (DAC), which is the extraction of CO2 from ambient air. Carbon dioxide in the air is very dilute (there are only around 400 molecules of CO2 in a million molecules of air), so extracting it was thought too costly to make these kinds of DAC techniques realistic. Today, several demonstration plants are in operation, and Climeworks is expecting to commercialize the technology, aiming to capture 1% of global carbon emissions by 2025. We visited a coal-fired power plant with one of the first Carbon Capture demonstration plants. We learned about the carbon markets from the designers of Chinese carbon market standards, and from ‘carbon accountants’ who are working to develop emissions inventories. At the Carbon Capture and Storage Research Center at the Shanghai Jiao Tong University we learned about the recently opened Low Carbon College, which centers its education on low-carbon industry on three directions, low carbon engineering, carbon policy and carbon finance. This interdisciplinary approach follows from understanding of the technology as a complex sociotechnical system, which is exciting to see and learn from this experiment in structuring truly interdisciplinary, problem-led, technical education. Our next phases include organizing, activating and expanding all the fascinating material collected, relationships developed and paths forged for new ways of thinking about the carbon cycle, with Chinese partners, and in China. Image: Professor Zhu gave us a tour of his lab and discussed the benefits of engineering C4 into rice. One way he sees his work is as a kind of deep-time realignment of the of plants with the environment. Most earthly plants evolved when atmospheric conditions were very different, and we can now design a more optimal photosynthesis machine for today’s environment. The demand for crop productivity is projected against continuous population growth and changes in diet. “We need 50% more productivity,” he says. This is a promise that has purchase with Bill and Melinda Gates Foundation and other funding agencies. The project is a multinational collaboration developed spanning the last 10 years and funded by both private and state funds. Image: The lab is trying to genetically engineer a C4 metabolic pathway into C3 plants, beginning with rice as a pilot plant species. Image: On the lab’s farm outside Shanghai, the different tests can be scaled up to field experiments. Image: Climeworks collectors in Switzerland, atop Hinwil waste recovery plant in Zurich. Image: Lab setup at SJTU, Jiao Tong University, demonstrating three different mechanics of isolating CO2 form emission stream. The valve is our collection was part of this complicated setup that the PhD students were putting together. Image: Dr Zhang Yongjie of Boasteel’s research division, describing a heat recovery prototype, one of the 7 approaches in which the plant can reduce its energy use. With its Paris Agreement commitment to lowering emissions, China started putting in place policies that put pressure on the industry to make improvements in efficiency. Baosteel’s average total CO2 emissions are 35.83 million ton/year. Its current mandate is to reduce emissions to 90% of this number by 2020. Image: The entrance to the Baosteel power plant, north of Shanghai. 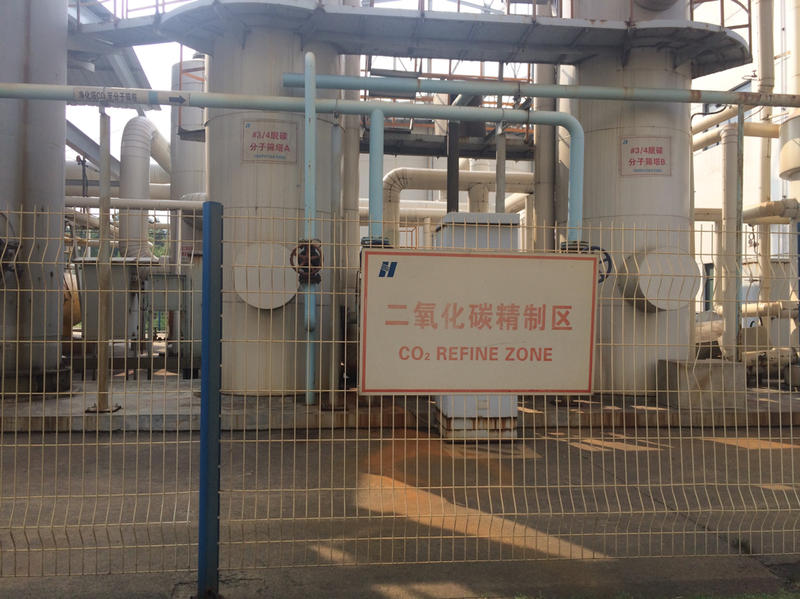 Image: The CO2 captured at the Baosteel site is ‘food grade’ quality, which means over 99% pure CO2. It is reused in the beverage industry - pumped into soda drinks that are bottled in Shanghai and sold all over Asia. Whether it be in ancient Greek mythology or recent super hero movies, flying always seems to have been an obsession for humans. While we may have achieved the dream of flying with airplanes, some would point out that we are disconnected from the real experience of flight, as we are operating a machine, instead of truly flying ourselves and flapping our own wings. With recent developments in VR, Max Rheiner, a professor at the ZHAW in Zurich, sought out to create an immersive flying machine to truly provide humans with the emotions and sensations of flying like a bird. And Birdly was born. On August 30, swissnex China co-organized a lecture under the topic of ‘Interfacing with Extended Realities’ in Shanghai as well as the world premiere of the experience ‘Jurassic Flight’. LIU Zhejun, Professor of Tongji University, Max Rheiner, CEO of Somniacs, LU Min, COO of VR Times, and Salar Shahna, CEO of World VR Forum, provided valuable insights. For instance, Max told the story of how Birdly came about and discussed other past and future projects with the audience. The public can try the flying experience at the exhibition venue. For more information regarding tickets, please check onsite. Opening time & address: 10am-10pm, 31st August – 2nd September 2018, S107, 1F, HKRI Taikoo Hui, 789 West Nanjing Road, Shanghai. 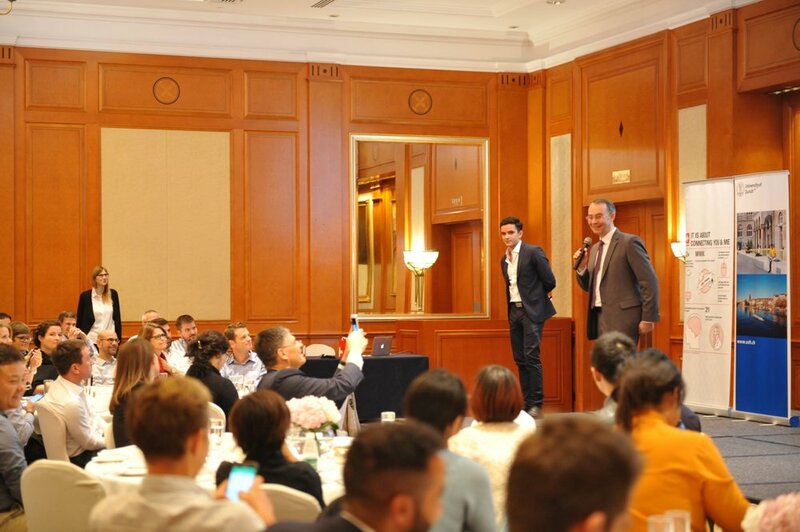 “Connect, Grow, Achieve”: These were the keywords of the evening of Thursday August 9, 2018, as the Young Swiss in China came together for a special evening with presentations examining various China-related topics from four speakers, including Iwan Wuelser, CEO of LeapRight Consulting, Didier Quarroz, founder of Shateso, Jessica Li, CEO Assistant of SIGG Outdoors, and Quentin Gigon, Junior Project Manager at swissnex China. The evening was marked by an especially large audience, as ICL is organizing its annual program whereby young Swiss people get the opportunity to spend a summer in China in various professional functions. In addition to the presence of almost 30 of these beneficiaries of ICL’s support, there was also a special delegation of four high school students from the Canton of Neuchatel, which sponsors a China Discovery Program every year. With fresh insights into topics such as cultural adaptation in Shanghai from a Swiss perspective, launching a startup in China, as well as a reinventing a classic Swiss brand, the night was enriching and provided a great platform for networking among this unusually large crowd of young Swiss people. It was with pleasure that swissnex China contributed to the night through both the presence of several of its representatives as well as through a presentation about the Innovation Landscape in China. A warm thank you to Fabien Abbet, Pascaline Salvi, and Noémie Nussbaum for the organization of this great evening.